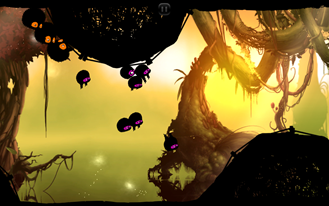 Badland is a game about adaptation – the rotund birds you control in this title are simple things that fly up and to the right at your direction, but they're always changing. Toss in a few power ups, and things get wild really fast. The game can change in an instant and you have to be ready for it. Just survive – that's all you need to do, but the assortment of unexpected dangers and physics puzzles make this game something to take a closer look at. Badland could be described as a physics-based sidescroller, but I find that it doesn't really fit neatly into any one genre. At times is feels like an endless runner, but at others it's almost a platformer. What it comes down to is that you tap on the screen and a tiny, fluffy animal flaps its equally tiny wings and drifts up into the air. 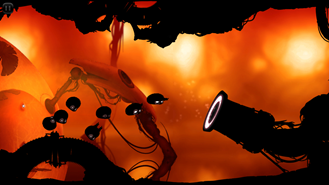 That's the extent of the controls in Badland. The longer you press, the higher the fluffball bird will fly and the farther to the right it will go. Don't fall off the left side of the screen or get smashed by some sort of trap to make it to the next stage. 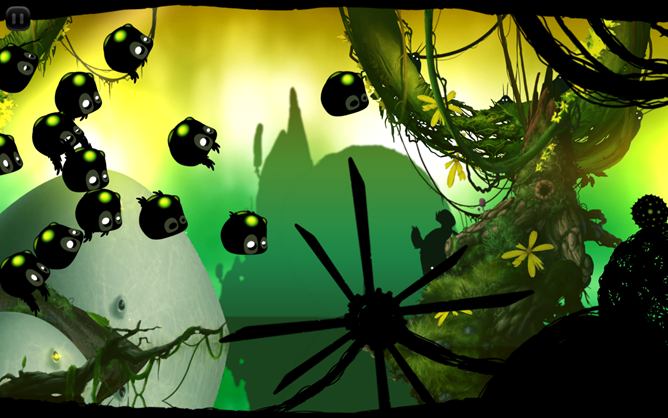 The first few levels are easy – you get used to the weight of the flier and the feel of Badland's physics. 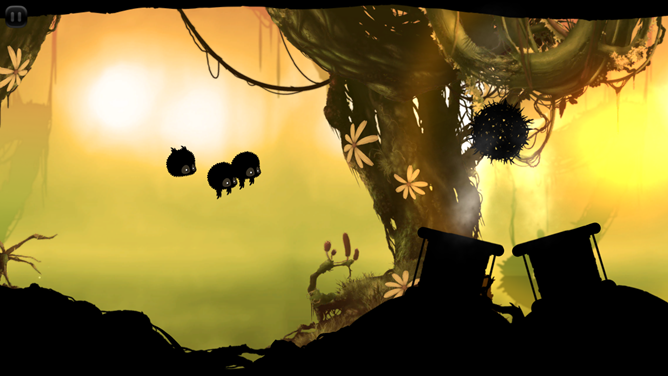 Then Badland throws you some curve balls. You're not just trying to save one tiny flying creature, there is a whole swarm of them. Throughout the levels there will be pods of more fliers, called clones. They join your flock when picked up, but the flock doesn't move as one monolithic unit. Sure, they all flap when you press on the screen, but each unit has its own momentum and trajectory. You can only control them so much, but that's part of the challenge. 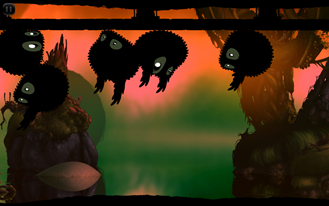 Just when you think you've sorted out how to manage a swarm of these things, you'll start encountering the plethora of power ups in Badland. There are objects that make your birds larger or smaller, others that make them sticky or bouncy, and a class of doodads that make them roll like wheels in one direction or the other. These are not just visual changes, either – the birds actually respond differently to your tapping when their properties change. Grabbing a power with any one of your clones will translate the effect to all of them too. There are times you have to use this to your advantage to make it past some trap or danger. There are no instructions telling you what's dangerous and what isn't. You'll have to learn the rules of this strange world by trial and error. Here's a quick preview: the round-ish nubby things explode and knock you around, the big spiny things kill you on the spot, and the little spiny things just stick to you and make it harder to fly. Additionally, it might look like fun to ride that network of gears through the level, but it's probably going to squish you if you're not careful. This sort of learn-by-dying gameplay could be annoying, but I think Frogmind made it work – individual clones (even the one you start with) are expendable, so you can feel free to experiment. All the ways this game finds to kill your clones are very clever. 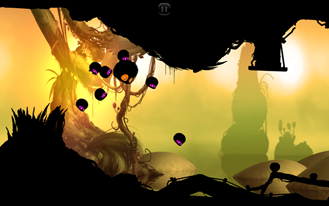 There are 80 levels in Badland, 40 of which you can play for free (ads after the first 10). I thought at first this game would get a little stale, but it keeps throwing new things at me. At one point a giant gun emplacement started shooting rocks at my clones to slow them down. 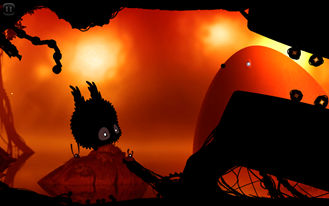 I did not expect that, and it's indicative of Badland's unexpected nature. In addition to the single player levels, you can set up local multiplayer games with up to four players on one tablet. Each party gets an area of the screen to tap for control, and it's a no-holds-barred rumble in the forest to see who survives the longest. Want to knock your opponent into a saw blade? Go for it. 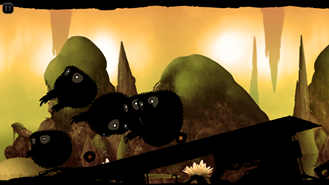 Badland has inky black silhouettes in the foreground that make up the terrain and your flock of clones. The background, by contrast, is incredibly bright and vivid. It's a good look, but this isn't the only game to implement it – Totem Runner is just one recent example. 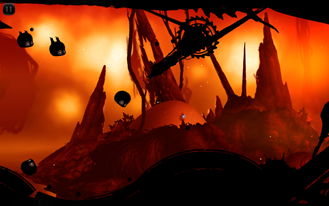 That said, Badland is beautiful. There's a ton of detail in the brightly colored backdrops and the perspective shifts as you fly through the level. It's actually several layers of backgrounds that get hazier the farther away they are. The effect makes this 2D game feel like it has some depth. Even though the part of the game you're interacting with is almost entirely black, you can still tell what things are. A tangle of dry branches, decaying pipes, a hollowed out log, and deadly saw blades – you instantly recognize what kind of terrain you're traversing, though the traps and puzzles aren't quite as obvious. The clones are not actually entirely silhouettes – they have eyes. Somehow they convey a lot of emotion too (usually either fright or extreme terror). You actually feel bad for them when they're torn apart by a saw blade or skewered on a giant pincushion. I haven't see a hint of lag, even with a ton of clones on the screen bouncing every which way. 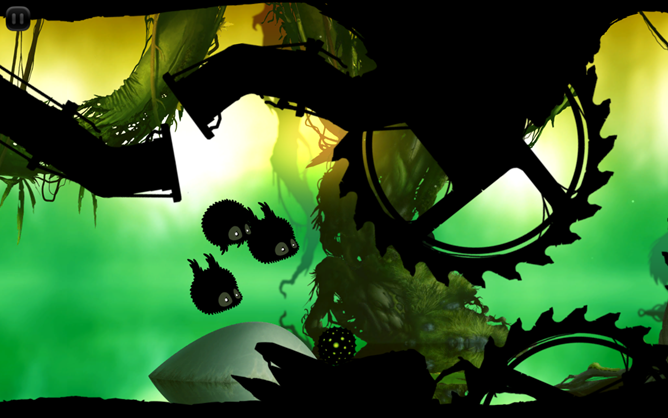 I do feel like Badland is a little hard on the battery, and my phone does heat up quite a lot while playing. However, it's not unmanageable drain. 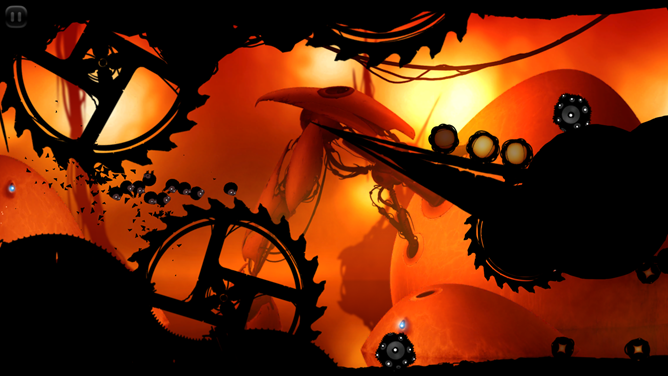 One more thing: the developers have graciously added immersive mode to Badland for Android 4.4 devices. This completely hides the navigation and status bars while playing so you can take advantage of the full screen. This is the first game I've seen do this, but I hope everyone follows suit. 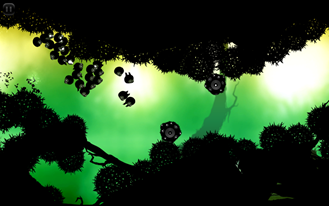 Badland didn't come to Android first, but it doesn't feel like just another port. The developers have implemented all the features of Google Play Games including the aforementioned immersive mode and cloud saving of progress (yay). The performance is also absolutely perfect on all the devices I tested it with. You don't even have to drop any cash to play this game – 40 full levels for free? Yes, please. It's only $2.99 to unlock the entire game, plus multiplayer with no ads. This is exactly how in-app purchases should be used. Badland is definitely worth your time and money.